We present a dog-tail interface for communicating abstract affective robotic states. We believe that people have a passing knowledge to understand basic dog tail language (e.g., tail wagging means happy). This knowledge can be leveraged to understand affective states of a robot. For example, by appearing energetic, it can suggest that it has a full battery and does not need charging. 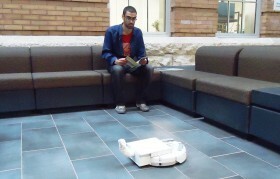 To investigate this, we built a robotic tail interface to communicate affective states of a robot. We conducted an exploratory user study to explore how low-level tail parameters such as speed influence people's perceptions of affect. In this paper, we briefly describe our study design and the results obtained. Download the A Dog Tail for Communicating Robotic States video file. Ashish Singh and James E. Young. 2013. A dog tail for communicating robotic states. In adjunct proceedings (video abstracts) of the 8th ACM/IEEE international conference on Human-Robot interaction - HRI '13 (2013), 417-418. Best Video Award 2nd Prize.